The next meeting of the Society takes place on Thursday 10th May 2012 at 7:30 pm in St. Andrew’s Church, Bilston Street, Sedgley. The short Annual General Meeting is followed by a talk – Lighting up the Past. The speaker is John Hughes a retired installation inspector with the Midland Electricity Board and stalwart of the Black Country Memories Club. John is an avid collector of old electrical equipment and period photographs and will be reminiscing about the days before low energy bulbs and fused plugs. 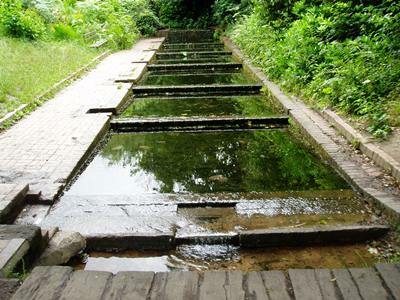 We asked whether you knew what purpose this unusual water feature served and where it was. Well .... these watercress beds were built in Victorian times to provide a regular supply of fresh cress for meals at Himley Hall for the Earl’s family and their guests. A spring still provides a steady flow of fresh water over the shallow terraces making an ideal environment in which to grow cress. Today the beds, by the Spring Pool in Baggeridge Wood, are home to the very rare white clawed crayfish.